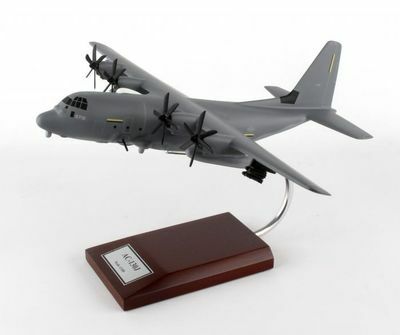 Our AC-130J Ghostrider Airplane is a replica scale model of the original aircraft manufactured for the USAF by Lockheed Martin. The Ghostrider uses Rolls Royce Turbo-Props, and has had its first test flight at Eglin Air Force Base. The expected delivery of the final version to the Air Force Special Operations Command (AFSOC) is currently slated for 2025. This authentic, extraordinary replica of the original aircraft has been faithfully reproduced with kiln dried Philippine mahogany wood. Each model is meticulously carved, hand sanded and painted following exact blueprint details of the original aircraft. The result is a handsome, wood airplane sculpture to be admired and enjoyed. It also arrives with an attractive wood base for display.